FLOW: Can You See the River? is an art-initiated project that reveals important and unique elements of the White River water system in engaging and innovative ways. Join us as we explore the history, ecology, origins, and potential of the river, and learn how the water system affects your everyday life. Visit the White River and canal system and engage with carefully placed mirrors and oversize red ‘map pin' markers that extend from the IMA and the Virginia B. Fairbanks Art and Nature Park all the way to the White River State Park downtown, pointing out and interpreting key aspects of the watershed. 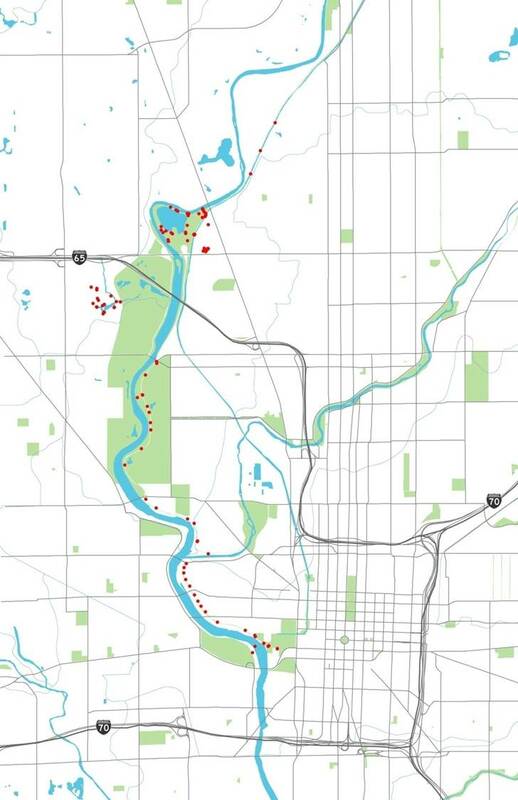 Use the Raindrop mobile app to track the path of a raindrop from your home to the river; Rediscover and celebrate the river during the White River Festival, September 22nd –October 1st. FLOW was initiated by visual artist Mary Miss, commissioned by the Indianapolis Museum of Art and co-created and facilitated by EcoArts Connections with more than 20 leading arts, science, environment, and municipal organizations and agencies.